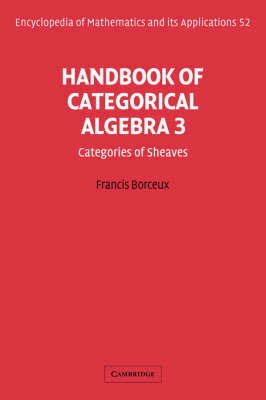 The Handbook of Categorical Algebra is intended to give, in three volumes, a rather detailed account of what, ideally, everybody working in category theory should know, whatever the specific topic of research they have chosen. The book is planned also to serve as a reference book for both specialists in the field and all those using category theory as a tool. Volume 3 begins with the essential aspects of the theory of locales, proceeding to a study in chapter 2 of the sheaves on a locale and on a topological space, in their various equivalent presentations: functors, etale maps or W-sets. Next, this situation is generalized to the case of sheaves on a site and the corresponding notion of Grothendieck topos is introduced. Chapter 4 relates the theory of Grothendieck toposes with that of accessible categories and sketches, by proving the existence of a classifying topos for all coherent theories.